The housing of 9,7’’ tablet of PocketBook SURFpad 4 series is made of high quality anodized metal alloy with bright soft-touch inserts. Powerful and energy-saving octa-core 1,7 GHz CPU and 2GB of RAM will provide great speedwork and smooth and rapid application response. 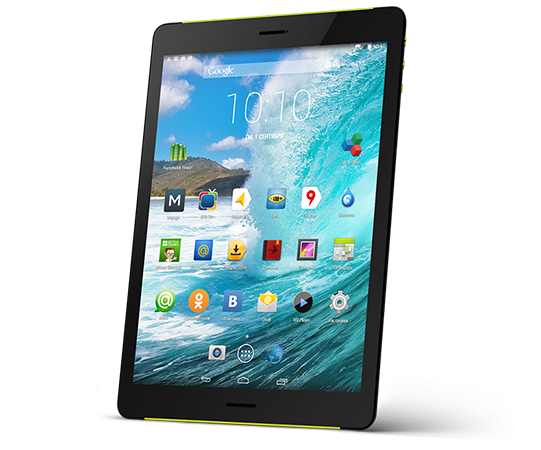 PocketBook SURFpad 4 tablets are running under the latest Android 4.4 KitKat OS. And 16 GB of flash and SDHC and SDXC memory cards slot will help to forget about free space lack. PocketBook SURFpad 4 L got a supercapacious 8000 mAh battery, which is more than enough to forget about searching a charger at the most interesting moments of the film or while communicating on the web. GPS will make your tablet a full-featured GPS navigator which will also show all the traffic jams with an in-built 3G Internet modem. PocketBook SURFpad 4 tablets are equipped with the two cameras - a main (8 MP) with autofocus to create high resolution images and the front (2 MP) focusfree - for video calls. Listen to your favorite radio station not only online, yet, via in-built FM tuner. And what is more all the three devices are equipped with standard audio mini jack. PocketBook SURFpad 4 L – is a perfect device for multimedia and Internet surfing. 9,7 inches screen with 2048x1536 pixels resolution and 4:3 aspect ratio will suit not only for Internet surfing yet also for HD video watching and speakers at the front panel on both screen sides provide stereo sound. A graphic quad-core processor is great for fans of the latest computer games. With PocketBook SURFpad 4 tablets you do not need to worry that your favorite game will go down at the most intriguing moment. 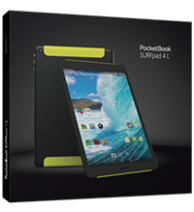 The new PocketBook SURFpad 4 tablets received: dual-band Wi-Fi, a full 3G Internet via micro-sim cards and Bluetooth 4.0. These features allow users to be online anytime anywhere and provide limitless opportunities for communication. PocketBook SURFpad 4 line supports Miracast a peer-to-peer wireless screencasting standard, which enables real-time broadcast even of the "heaviest" video and audio content to other devices.